You are gifted! God has given you gifts that He desires you to use for His kingdom. There is work for you to do!! People will try to stand in your way of accomplishing God’s will for your life. People may discourage you. You may get laughed at. You will probably be talked about. You may even face real persecution because of the name of Christ…rejoice my friend and keep on keeping on! Keep your eyes focused on Him and run with perseverance the race He has marked out for you to run. 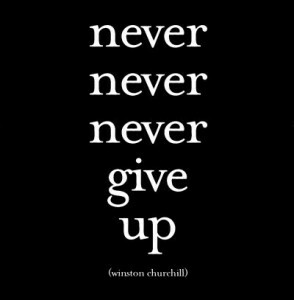 I want to encourage you today to NEVER, NEVER, NEVER give up! You do what you believe God is calling you to do. You do it to the best of your ability and you give HIM all the praise and glory for what He accomplishes through you! Get ready my friend—-get ready and RUN!